The Underwoods (Robin Wright, Kevin Spacey) in the Oval Office. On November 8, 2016, House of Cards showrunners Frank Pugliese and Melissa James Gibson were on set block-shooting episodes 10 and 11 of the show’s fifth season. Many of the women on set that day came to work in pantsuits, a salute to Hilary Clinton, whose historic victory they expected to celebrate later that night. Which is not to say, Pugliese hastens to add, that there weren’t Trump supporters on set as well. But like most everywhere else in the country, and possibly in the world, the overwhelming sense was that after a bitterly divisive campaign that many felt had brought out the worst in America, the country was poised to elect its first female president. Looking back, Gibson describes the memory of all those women on the set of the show’s White House, where the ruthless Frank and Claire Underwood (Kevin Spacey, Robin Wright) have been ensconced since Season 3, as surreal. “We probably stopped shooting around 7pm, so there was not enough information at that point,” she remembers. Season 5 is Pugliese and Gibson’s first as co-showrunners. When they took over for series creator Beau Willimon after Season 4, they couldn’t have known that they would be helming the first season of House of Cards of the Trump era. No matter what, this season—and in retrospect, the entire series—will now be viewed in the context of the Trump presidency. It’s a phenomenon that isn’t specific to House of Cards, or even to political dramas. In 2017, there’s not much on TV, or in culture in general, that won’t be read in some way as a reaction to or reflection of the unprecedented political climate. The same probably would have been true had Clinton won. Still, House of Cards seems particularly apropos of the current moment: the conspiracies, the corruption, the uniquely reprehensible man in the Oval Office. “We do a lot of research, and we work with experts and try to keep in touch with what’s happening on a daily basis, politically,” Pugliese explains. Work on Season 5, which takes place during the general election that pits the Underwoods against Republican nominee Will Conway (Joel Kinnamen), actually began during the 2015 primaries. “But I can’t say it was directly affecting what we were working on,” says Pugliese. House of Cards has never been a “ripped from the headlines” kind of show, though there have always been elements that echoed what was going on in culture and politics: the Underwoods’s dealings with the Russian president (Lars Mikkelsen), Franks rhetoric about populism and nationalism, last season’s climactic arch about a hostage situation involving a homegrown terrorist cell known as ICO. Contemporary politics is, Gibson says, “the backdrop of what we do.” The daughter of a Canadian politician and a journalist, she grew up keenly aware of politics. 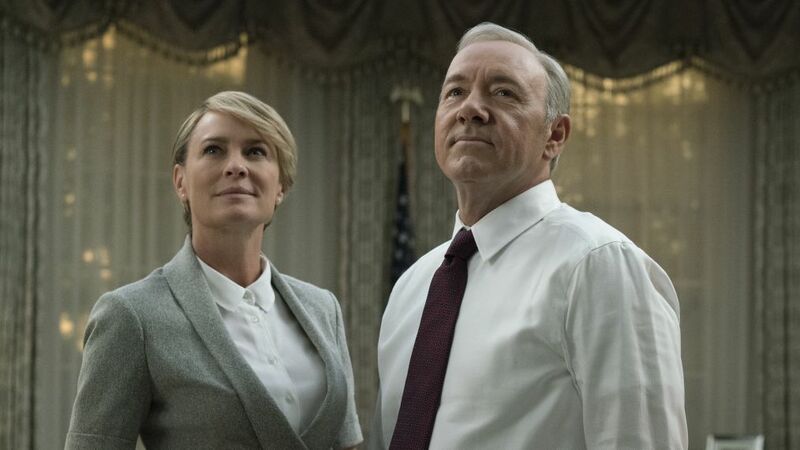 No matter what is going on in real life politics, House of Cards is, ultimately, telling a story that was begun five years ago—the story of a very particular relationship, and very particular characters who will do anything to consolidate power. Some critics have characterized the show as a political soap opera dressed up in the trappings of a prestige drama. The show is often Shakespearean in its audacity, the Underwoods’s machinations regularly stretching the limits of credulity. Until recently at least. Frank Underwood doesn't see his rule ending anytime soon. It should go without saying that the news coming out of the White House on a daily basis is anything but boring. The steady stream of leaks and scandals has been great for late night, with shows like The Late Show, Full Frontal with Samantha Bee and SNL seeing a boost in ratings. But will the appetite for political commentary translate to House of Cards? There is apparently a running joke among Beltway insiders: House of Cards is what Washington wishes it was like, but Veep, HBO’s comedy about the venal, incompetent squabbling and chaos at the heart of government, is what Washington is actually like. Gibson and Pugliese have heard that one before, but it still strikes them as perversely funny.